Dan Ryder, a language arts teacher at Mt. Blue High School in Farmington, has been chosen as one of five teachers nationwide to receive the NEA Foundation’s prestigious Horace Mann Award for Teaching Excellence. WASHINGTON, DC — Mt. 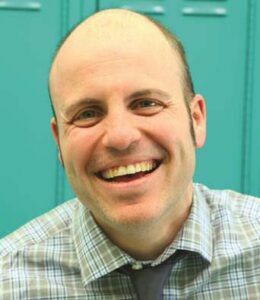 Blue High School teacher Dan Ryder is one of five educators to receive one of public education’s highest honors, the NEA Foundation’s prestigious Horace Mann Award for Teaching Excellence, recognition as one of the nation’s top educators, and $10,000 on Friday, Feb. 8. • Matthew Bacon-Brenes, a dual language immersion mentor teacher in Portland Public Schools in Portland, Oregon, nominated by the Oregon Education Association. • Leah Juelke, a 9th to 12th grade language arts educator for English learner (EL) students at Fargo South High School in Fargo, North Dakota, nominated by North Dakota United. • Dan Ryder, a 9th to 12th grade language arts educator at Mt. Blue High School in Farmington, Maine, nominated by the Maine Education Association. • Cynthia Tong, an 8th grade social studies educator at Ewa Makai Middle School in Ewa Beach, Hawaii, nominated by the Hawaii State Teachers Association. • Cicely Woodard, an 8th grade mathematics educator at Freedom Middle School in Franklin, Tennessee, nominated by the Tennessee Education Association. Each will be featured in a video shot at their school including their students, which will premiere at the gala. The NEA Foundation and the National Education Association jointly present the awards, which are sponsored by NEA Member Benefits, the Horace Mann Companies, and California Casualty. Educators will be celebrated at the NEA Foundation’s Salute to Excellence in Education Awards Gala on February 8, 2019 by over 850 leaders in public education, philanthropic, and business sectors, in Washington, DC, and by many more viewers online. Students, colleagues, peers, and family members of awardees host viewing parties to watch live streaming video of the program at home as awardees from across the nation are recognized.